Autostyle is the UK's leading manufacturers of individually tailored car mats, supplying customers with top quality products for over 20 years. Your car is an investment, and naturally you will want to keep it in tip-top condition. In addition to adding a touch of style to your vehicle, their customised car mats will protect the interior, keeping the carpet free of dirt and stains. The mats are available in a variety of colours with coordinated binding, cut precisely to fit your particular vehicle. 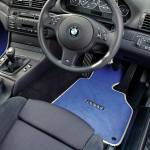 Whether you are looking for BMW car mats, Audi car mats, VW car mats or even that one-of-a-kind item for a Lamborghini or DeLorean. Carnoisseur in conjunction with Autostyle will work with you to create a mat that is tailored to your individual requirements.